Hoping to help charities fearing changes in federal tax laws, a House panel voted Wednesday to let Arizona residents take both the standard deduction on state tax forms and also write off their charitable giving. But that generosity could reduce state tax collections by up to $30 million. The 6-4 party-line vote on the Republican-dominated Ways and Means Committee followed pleas from various charities who said they already are seeing a drop in donations because of the federal Tax Cut and Jobs Act. That law not only decreased certain deductions but doubled the amount that individuals can claim in a standard deduction. That, in turn, is resulting in more people choosing not to itemize. More to the point, without any benefit of a deduction, some charities report that people are giving less. Arizona’s own standardized deduction has not changed. But Rep. Ben Toma, R-Peoria, who chairs the panel, said HB 2359 could provide some additional incentive for those who take the standard deduction to also make charitable donations. Deductions are exactly that. Taxpayers get to reduce their taxable income − the amount against which taxes are computed − by the allowed amount. That differs from tax credits, which are not at issue here, where people reduce what they actually owe the government on a dollar-for-dollar basis. Economist Dennis Hoffman of Arizona State University said his research predicts that donations to charities will drop by about 5.2 percent as a result of people choosing the now more-generous standard federal deduction instead of itemizing. Jeff Taylor who represents the Salvation Army, said his own organization’s experience to date shows that donations are down by anywhere between 7 and 10 percent, what he said is a big hit for the division’s $93 million budget. All of that, he told lawmakers, affects the organization’s ability to operate the largest network of drug-treatment centers in the state but also offer housing for domestic violence victims and families. 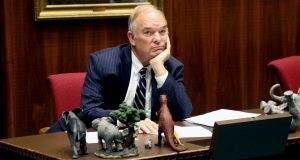 HB 2359 would help compensate for that loss as Arizonans who claim the standard deduction and may not give would now have an incentive to do so. The other side of the equation, though is that Hoffman said that allowing Arizonans to claim both the state standard deduction and get yet another deduction for charitable giving could reduce state revenues up to $33 million. Rep. Mitzi Epstein, D-Tempe, said the legislation is based on the premise that Arizonans will give to charities only if they get a financial incentive to do it in the form of an additional state deduction. She argued that people who give now will continue to do so. And Epstein said the solution offered by this legislation actually provides a double deduction: One for the standard deduction which is designed to factor in all typical deductions, including charitable donations, without having to itemize them, and an additional one on top of that for what’s given to charities. Kathryn Chandler, executive director of Northwest Valley Connect, told lawmakers of her own concerns about losing money for her organization’s services of helping people without other forms of transportation go to everything from doctor’s appointments to shopping and social trips. And she said that’s particularly critical in the communities served, including the Sun Cities, given the lack of mass transit. Chandler said virtually all of the $250,000 annual budget goes to the purchase, gasoline and maintenance of accessible vehicles, as there are just two paid staffers and many of the other rides are offered by volunteers in their own vehicles. She said if they take a hit in charitable donations that will require curbing some of the more long-distance trips, like veterans from as far away as Tonopah who need to get to the Veterans Hospital in downtown Phoenix. Rep. Andres Cano, D-Tucson, said he is grateful for all the work done by charities. “We need you to continue to deliver on the vital services,” he said. But Cano said he has to consider that money from state taxpayers is being diverted. And Cano said that, personally speaking, he will continue to give, whether or not he gets a state tax deduction. The legislation still has to clear the House Appropriations Committee before going to the full House.